Jason Isringhausen, according a news feature on the St. Louis Cardinals Official Web Site, is likely done pitching for the balance of the 2008 season. Medical staff report "right elbow tendinitis and a partial tendon tear in his flexor group." It is highly likely that "Izzy" will be able to return to action next season. As for former ace Chris Carpenter, he had a throwing session (not pitching) yesterday, and will throw again today at Busch Stadium. The Cardinals are taking plenty of time with Carpenter to be careful of his health. Yet another former ace, Adam Wainwright, threw a bullpen session yesterday, and has announced that he is once more ready for major league action. 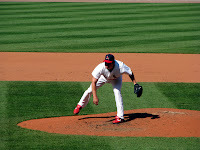 The big question now is whether the Cardinals need him more in a reliever's role or back in the starting rotation.